How to add watermark to video ? 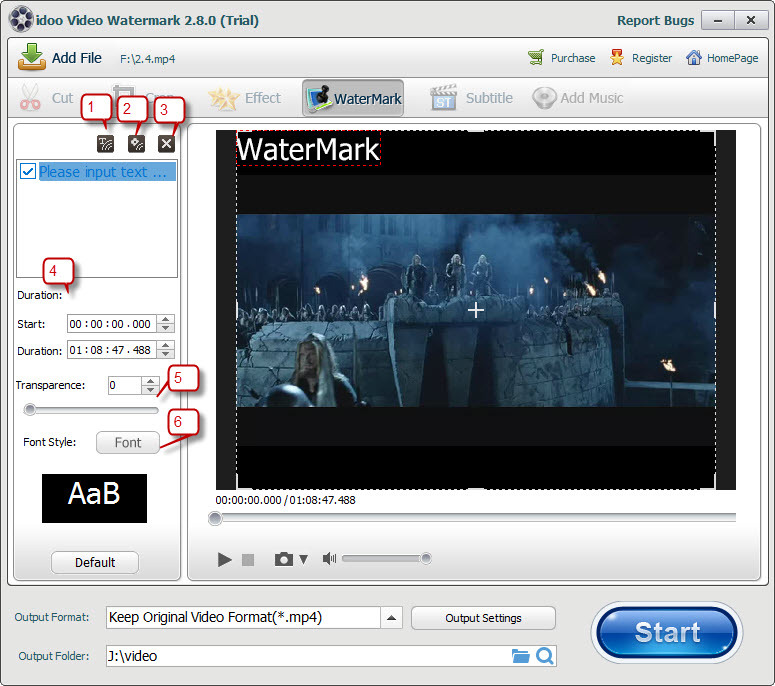 It is easily to add watermark to video with text and image with idoo Video Watermark software, below will show you how to use it. First you need to add a video you want to add watermark, then you will see following program interface. 1. Click “Add Text Watermark” button to add watermark. 2. Click ”Add Image Watermark” button to add image. 3. Click “Delete Selected Watermark ” button to delete text or image. 4. Enter the watermark video duration, the default setting is for a whole video. 5. Change the Front Style, if you don’t like the default one. You can add both text and image watermark, and add more than one images and tests at a time. Preview the video and take a screenshot is also available. At last, select an output video format, and click “Start” button, after a few munities, you can get the job done.